A small change in the genetic makeup of the South African Cape bee turns the socially organised animal into a fighting parasite. This change ensures that infertile worker bees begin to lay their own eggs and fight other colonies. In the current issue of the journal Molecular Biology and Evolution, an international research team led by Martin Luther University Halle-Wittenberg (MLU) outlines for the first time the genetic basis for this rare phenomenon. Bees are social insects that live together in large colonies with a distinct social structure. Usually, roles are clearly distributed within a bee colony: In addition to male drones, there are numerous infertile female worker bees that care for the nest and provide for the queen. The queen is solely responsible for producing the colony's entire offspring, with the male drones developing from her unfertilised eggs and female bees from the fertilised ones. New queens only emerge when the colony divides or when the previous queen has died or is too old to continue to produce new offspring. The situation is different for the South African Cape bee. 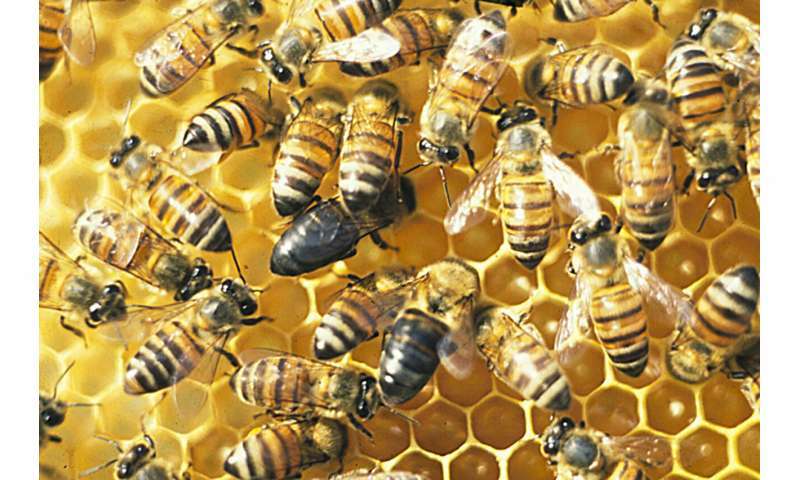 Some of its worker bees are able to produce female offspring from unfertilized eggs. After the animals have been raised in their own colony, the false queens begin to reproduce more of their kind and can invade foreign but closely related bee colonies and ultimately take over their hives. The behaviour was first observed in the 1990s by beekeepers trying to establish the Cape bee in a region of South Africa where another honeybee subspecies lived. "The phenomenon whereby worker bees have fully developed ovaries and the ability to produce their own offspring from unfertilised eggs occasionally happens and is called parthenogenesis," explains biologist Dr. Eckart Stolle, who carried out the study at the Institute of Biology at MLU along with Dr. Denise Aumer and Professor Robin Moritz. Unlike normal honey bees, Cape bees produce females—not drones—from unfertilised eggs. This phenomenon is known as thelytoky. "The syndrome is uncommon but evolutionary makes sense: When a queen dies suddenly, this process is a way to save the colony," says Aumer. For several years, scientists have been looking for the genetic basis for thelytoky and for reasons why not all bees have it. The biologists from Halle have finally unlocked the key to understanding this process: They compared the genome of Cape bees that produce parasitic offspring to those that produce normal offspring. The scientists discovered a special gene that is responsible for the development of the parasitic offspring. A tiny variation in the code of this gene ensures that thelytoky is set in motion. The researchers were also able to show that this is a dominant genetic trait. "Over time, this should result in more and more bee colonies with this trait. However, this is not the case. Obviously, the underlying mechanism is more complex," explains Stolle. The scientists suspect that the thelytoky variant only works in combination with the normal variant or that the thelytoky variant on its own may even be lethal for the animals. To date, thelytoky has only been witnessed in a handful of species, including several globally invasive ant species. The work carried out by the researchers in Halle now provides another basic clue to understanding this phenomenon.